Separated from her husband, Alice (Reese Witherspoon), moves back to her family home in LA with her two children. While celebrating her 40th birthday, she comes across three young men who are embarking on Hollywood careers. Through a series of improbable events the young director (Pico Alexander), writer (Jon Rudnitsky), and actor (Nat Wolff) end up staying in Alice’s guest house, and Alice finds herself enjoying having the young men in her life. You can certainly see the old adage of “write what you know” in writer and director Hallie Meyers-Shyer’s work. As the daughter of a writer/ director and a writer/ producer there is more than a touch of Hollywood about this film. There is also more than a touch of “Hollywood” about this film, in the completely unrealistic script, utterly unbelievable characters, and utterly fantastical way that reality seems to work. This year we’ve seen talking space raccoons, zombie pirates, demonic clowns, immortal Amazonian warrior princesses – and Home Again still might be the most unbelievable thing I’ve seen. There is a healthy dose of wish fulfillment about this script, from Alice’s Oscar-winning revered auteur of a father (as opposed to Meyer-Shyer’s Oscar nominated writer of Private Benjamin father) to the bevy of twenty-something men throwing themselves at a middle-aged single mother with kids, seeking a committed relationship. Acting also seems a bit of a stretch at times. 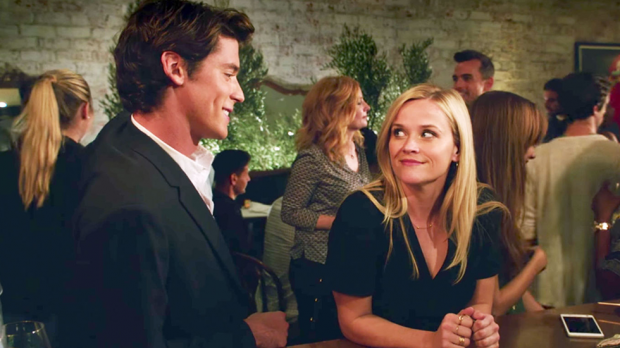 When Home Again reaches for drama, it is often at it’s worst, especially between the three young men, or Witherspoon’s comic nemesis (played by Lake Bell). At these moments, blessedly few and far between, the acting comes across as second rate, as if in a b-grade soap opera. So why not pillory this film mercilessly? Well, that takes a little more work to explain, and is a little more nebulous in concept. There may not be too much realistic about Home Again, but it does construct a rather charming story in it’s own right. The actors are far more suited in their delivery and style to a light comedy, so when the film leans into that, there is a certain appeal. Home Again, may be a fluffy wish fulfillment romcom, but within that modest set of goals, it actually achieves what it plans to do. Witherspoon is on safe ground here, not stretching her range, but revisiting what has worked previously in her career. Sheen gives a great performance as the absentee husband, giving a small role a lot of screen life. Rudnitsky, Alexander, and Wolff really bang out their performances to the cheap seats, but despite their lack of nuance, fulfill the roles adequately. Finally it’s always nice seeing Candice Bergen on the big screen, and she completely dominates it in a walk on role. In short Home Again, is a generally inoffensive film, which is simultaneously the highest praise you can lavish on it, and the most damning thing you can say about it.